Politicians are dangerously optimistic about autonomous cars. Two Florida lawmakers are working to loosen up state restrictions on self-driving technology. 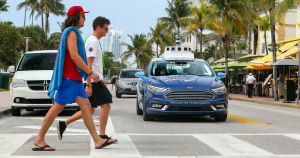 Representative Jason Fischer introduced a new bill that would allow self-driving cars to roam Florida streets with no human safety driver, according to the South Florida Sun Sentinel, and Senator Jeff Brandes, who’s pushed similar legislation in the past, plans to file similar legislation in the Senate. These politicians might be confident that true self-driving vehicles are ready for primetime, but that optimism doesn’t match the reality of the situation. Fischer told the Sun Sentinel that the bill is intended to cement Florida’s reputation as a leader in autonomous vehicle testing. He claims that his proposed legislation will allow self-driving car companies like Waymo and Uber to further develop technology without restrictive regulations — even letting a rider in the driver’s seat watch TV while the car navigated itself. But not everyone is excited about that prospect. During past attempts to lessen these regulations, many were concerned about whether or not the cars could be trusted to operate safely on their own. Right now, Waymo One is the only commercial ride-hailing service for autonomous vehicles, and every car still has a human sitting in the driver’s seat, even though some experiments go without a safety driver. That’s not to say that the law is the only thing holding Waymo One back from axing these safety drivers — autonomous vehicles regularly get confused or stuck when left to their own devices and require a human touch to get back on track, according to passengers of the service. The implication that people would finally be free to watch TV instead of the road is particularly troubling, given reports that the safety driver operating the Uber vehicle that struck and killed a pedestrian in March was streaming shows on her phone at the time. Technological progress is one thing, but expecting industries to regulate themselves has backfired time and time again. Given that the whole point of self-driving cars is to prevent the huge amount of accidents caused by human error, it would be exceptionally short-sighted to do away with restrictions that were put in place to keep people safe before the technology was truly ready.